Bruce A. Waite, a teacher at Mansfield Senior from 1959-1989, and an avid runner for over 30 years, was diagnosed with mesothelioma in 2002 and died in 2003. Mesothelioma is a cancer caused by asbestos exposure and can take take 10-50 years to develop. The Eighth Annual Bruce A. Waite Miles for Meso 5K Run/Walk is to honor the life and legacy of Bruce and to support critical mesothelioma research that will hopefully someday find a cure for this fatal disease. Proceeds from the event will benefit the Mesothelioma Applied Research Foundation. Learn more about Bruce's story by visiting the Bruce A. Waite Miles for Meso 5K Run/Walk personal web page! This year the Waite Family will celebrate the 8th anniversary of hosting the Ohio Miles for Meso race in Bruce's memory. Join them for this special day. The first 200 registered are guaranteed a race shirt. Last year, more than 350 people attended the race and raised $15,000 for the Meso Foundation. In the past seven years, the race has taken place it has raised more than $50,000 for mesothelioma research. NOTE: T-shirts are available for the first 200 registered only. Bruce A. Waite was a man among men. He stood strong in integrity in every aspect of his life. As an educator, Mr. Waite focused diligently on his students, and their opportunities to learn. He taught English (Advanced Comp, Great Books, Practical Reading and Writing) from 1959-1989, and served as National Honor Society advisor. He believed in the structure of the language and the practice of speaking and writing well. 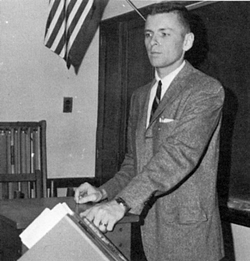 Many college professors remarked that they knew when freshmen students had completed classes with Mr. Waite because of their command of the English language. He did much more than simply teach - he imparted knowledge. He did not measure success by simply marking grades in a grade book, but by exacting a change in the lives of his students. And in keeping with his altruistic nature, Mr. Waite measured his success second to the successes of his students. His students were so important to him that he never forgot a name, even of those students from earlier years of teaching. He was a mentor for his students and his colleagues, and continually set the example of humility. He was a well-respected man and he lived his life with impact, although his humility never allowed him to understand the magnitude of his sacrifices for others. Bruce was an avid runner, never missing a day in over 33 years. Tendonitis (which required him to walk with crutches, and he put aside to run), illnesses, and severe weather did not stop his determination. He kept a running journal, in which he logged over 76,000 miles in numerous states. Nothing stopped him when he ran – the only time his step ever wavered was his encounter with a moose on the path while running in Wyoming. He ran as catharsis, and he did so with ease and freedom. In 2002, his breathing became more labored and a series of appointments and surgeries led to the diagnosis of mesothelioma – a cancer caused by asbestos exposure. His wife Nancy and daughter Jill by his side, Bruce's runs became walks, and then his walks became just the effort to breathe. His commitment to running was his greatest weapon against the mesothelioma, and as he did in every aspect of his life, Bruce Waite faced his illness with determination, but the insidious effects of this ravaging disease had been forming in his body for 30-40 years. the path to excellence, seldom traversed.